Decades ago, when working with SHIELD, Dr Hank Pym (Michael Douglas) invented the Pym Particle, a formula that alters atomic relative distance, reducing the space between atoms while increasing their strength. Using his discovery he became the original Ant-Man. However, after a terrible accident he gave up the superhero life and, concerned by the potential weaponisation of his technology, vowed to keep his formula secret. 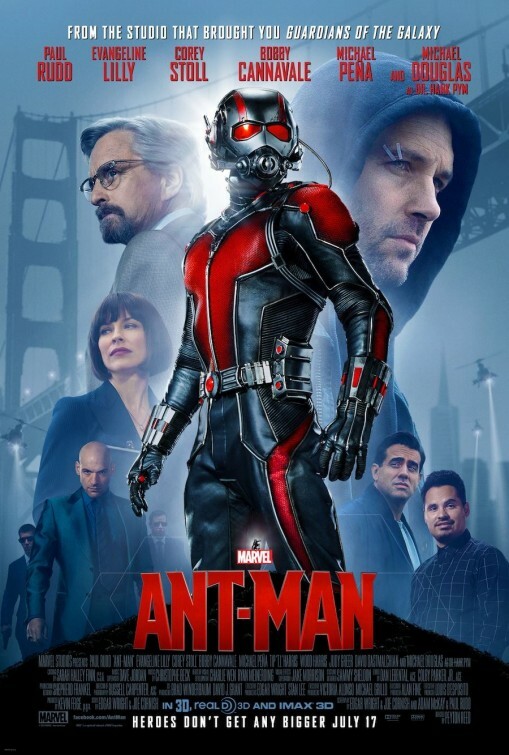 But now his former protégé, Darren Cross (Corey Stoll), who took over his company Pym Technologies and voted him out, is on the verge of unlocking the secret of the Pym Particle, so Hank needs someone to become the Ant-Man, break into Pym Tech and steal Cross’s research, and that someone is Scott Lang (Paul Rudd). Freshly out of San Quentin, Scott is a thief determined to keep on the straight and narrow for the sake of his young daughter Cassie (Abbie Rider Forston). While Avengers: Age of Ultron did gangbusters at the box office earlier this year – taking $1.38 billion at the worldwide box office on its way to becoming the sixth highest grossing film of all time – the film’s reception was largely lukewarm. With its many returning and new characters, and constant alluding to events from other franchises, audiences were starting to feel a bit of superhero fatigue. For Marvel Studios Ant-Man is a really savvy follow up to Avengers: Age of Ultron as it is an entirely different type of film. For starters, while containing the mandatory tie-ins with the central Avengers franchise – as well as a teasing allusion to the upcoming incorporation of Spider-Man into the fold – Ant-Man is the most self-contained film (with the exception of Guardians of the Galaxy) that Marvel studios have made in a long time. You don’t have to have seen the other films to enjoy Ant-Man. You feel like you have seen a whole film and that is a refreshing change. It also continues the Marvel tradition of dabbling in different genres. Where Captain America: The Winter Soldier was a conspiracy thriller, Ant-Man is a classic heist movie with the central action being a plan to break into a secure facility and steal something. In contrast to more recent Avengers films, Ant-Man brings the scale right down (no pun intended). Where in most superhero movies the fate of the world is at stake, most of the central conflict in this film is personal. Ant-Man is a film about redemption and second chances and is surprisingly intimate. It is a story of fathers and daughters – Scott and Cassie, Hank and his daughter Hope. While we are made to understand that there are certainly serious consequences to Cross developing and selling his technology, that is not as important to us as whether Scott can become the hero that his daughter already believes that he is. Ant-Man has a sweetness to it that does not exist in any of the other Marvel Cinematic Universe films and a lot of that comes from the likeability and charm of Paul Rudd. Not only is his Scott Lang the everyman superhero, more relatably human than any of Marvel’s other heroes, he is also the world’s most likeable thief. He insists on being called a burglar rather than a robber as robbery implies threat and he doesn’t like violence. While we first meet him in prison, we are quickly reassured that the crime which landed him there was a bit of a Robin Hood affair, stealing millions from the tech giant Vistacorp and returning it to customers who had been swindled. Now that he is out he is determined to go straight, all of his decisions being motivated by his desire to be present for his daughter, Cassie. In short, he is to cat burglars what Julia Roberts was to prostitutes in Pretty Woman. Let’s face it, when you are making a movie about a hero whose special ability is that he can shrink down to the size of an insect and control an army of ants, things have to be done with a certain amount of tongue in cheek and Ant-Man definitely does this. The final result is a different kind of superhero movie; funny, modest and intimate. But for fans, Ant-Man’s highly documented development troubles – British writer-director Edgar Wright (Shaun of the Dead, Hot Fuzz, Scott Pilgrim vs. the World) worked on the film for eight years before withdrawing due to differences with the studio – means there will likely always be ‘what-ifs’ accompanying the film. Have you seen Ant-Man? Leave a comment and let us know what you thought.